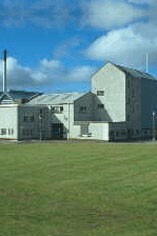 The Aultmore Distillery lies several miles north of the town of Keith on the eastern fringe of Speyside. The Aultmore distillery was founded in 1895 by Alexander Edward, son of David Edward and owner of Benrinnes. Alexander Edward was an important figure in the whisky scene; his ventures include Craigellachie and Oban distilleries. The financial crisis in the whisky industry during the prohibition in the United states forced the sale of both the Oban and Aultmore to new owners, John Dewar and sons in 1923. The distillery was renovated in 1970 and doubled its production to 4 stills. It is now managed by UMGD, a subsidiary of Diageo. A large part of the production is used in blends like Johnnie Walker. The signature style shows honeyed and toasty vanilla oak character.